Categories: Kitchen, Peugeot. Tag: Coffee Mill. The primary difference between Peugeot and all other brands are the spice-specific mechanisms. Peugeot has 7 unique spice specific mechanisms for pepper, salt, herbs and spices, coffee, wet salt, chili peppers and nutmeg. For each spice, there is one – and only one – Peugeot grinding mechanism, each made of the ideal design and constructed from the best material available for its intended use. All Peugeot mechanisms are made in France and carry a lifetime limited warranty. 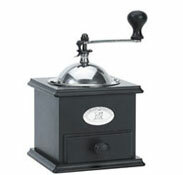 The Coffee Grinding Mechanism found in all Peugeot coffee mills is the foundation of Peugeot’s grinding legacy. The case-hardened steel mechanism efficiently cracks and grinds coffee beans to the desired consistency:from espresso fine to coffee- press coarse. Mechanism warranted for life against manufacturer and materials defects; body warranted for two years against manufacturer and materials defects.